It’s been a whirlwind of a semester in “English 10-714: Freedom and Imprisonment in the American Literary Tradition: A Multidisciplinary Approach”! Now that the class has drawn completely to a close–all digital projects and reflective essays turned in, grades submitted, and digital archiving commitments to the Texas After Violence Project (TAVP), the Human Rights Documentation Initiative (HRDI), and the American Prison Writing Archive (APWA) wrapped up–I’d like to report on some themes that emerged from students’ final reflective posts on our course blog. The students’ reflections not only provide immensely useful considerations as I look forward to future adventures teaching digital humanities; they also provide great insights into what the digital humanities can do and be in undergraduate liberal arts education. The TAVP partners with the HRDI to make oral histories pertaining to the death penalty in Texas digitally available to the public. As a class, we digitally archived approximately 15 hours of oral history testimony. In addition to regularly blogging, tweeting, and building independent digital projects using platforms such as Annotation Studio, Tiki-Toki, Omeka, and HistoryPin, our class transcribed 17 prison essays for the American Prison Writing Archive and digitally archived a whopping 15 hours of oral history testimony for the Texas After Violence Project. In this time- and labor-intensive enterprise, students took responsibility for transcribing, auditing, formatting, and synching transcripts with video for five oral history narrators whose stories are collected at the Human Rights Documentation Initiative. Students also created tables of contents and abstracts for the interviews, which will be made available to the public pending finalization by HRDI archivists. Explored collectively and comparatively, how do these multidisciplinary texts narrate shifting ideologies with regard to U.S. criminal justice? Whether explicitly narrative or not, what stories do these texts tell about about how criminal justice policies and practices impact people and communities inside prisons and beyond? What do these texts reveal about the power of narrative to establish, sustain, overturn, or transform widely held assumptions about prisons and the imprisoned? One student wrote that reflecting on the semester, “I see narrative in everything that we have read and watched and listened to. I learned a great deal about how the narratives Americans are exposed to about imprisonment and punishment have a great impact on how we view prison — views that I saw in myself, and that have definitely been impacted the way that I think about punishment in general.” Another student remarked that our course readings “destroyed the dissociation that I have had with those that are incarcerated and rather humanized them.” Yet another student concluded that “the work of listening and contextualizing that needs to be done around crime… broadens the discourse around capital punishment by urging us to think about corporal and mental punishment, almost akin to death, perpetuated by prisons… While we need to fight for reform and specific policy changes, there needs to be a vast overhaul of this system.” These students’ reflections, as well as many others not cited here, evidence how effectively our course readings challenged students to confront their own assumptions, beliefs, and thoughts about future directions with regard to U.S. imprisonment practices. With regard to oral histories, yet another student put forth “two specific nuggets of knowledge I learned in class: new ways of close-reading (transcribing, auditing, etc.) and the activist power of narratives.” For this student and others, the values of interactive close-reading and community engagement were closely tied in our interactions with digital oral history collections. Following are some further themes that emerged in student reflections on course learning outcomes, demonstrated with more quotes from their blog posts. Relatedly and in conclusion, one student reflected that in our “class about freedom and imprisonment,” she was frequently struck by the fact that her “own access to information and digital tools is very apparently a rare privilege.” Over the course of listening to audiovisual oral histories, reading from texts such as Fourth City: Essays from the Prison in America, Poems from Guantanamo: The Detainees Speak, and Reading Is My Window: Books and the Art of Reading in Women’s Prisons, and as a result of our class’ volunteer relationship with the Inside Books Project, our class learned that access to texts, oral histories, and other digital media is an important measure of freedom. By the same token, the lack of access to educational tools and texts faced by many people in prisons is a major factor of their imprisonment. The emotional component of the class. The controversial course topic, sensitive course material, and provocative voices and perspectives we encountered in course texts sometimes made for an emotionally charged classroom experience. With the exception of the final project, in which students selected a digital platform from which to conduct a literary analysis, the digital skill-building did not always interact with the literary texts. Over the course of the semester, we learned Annotation Studio, Omeka, Tiki-Toki, and HistoryPin in preparation for the final project assignment. This, in addition to learning video-editing skills and the digital archiving software GLIFOS, was indeed a lot (probably too much) to cover, in light of our heavy reading load, regular social media contributions, and task sessions for the Texas After Violence Project and the American Prison Writing Archive. Several students suggested spending less time on skill-building, and more time independently applying selected digital tools to course texts. Assessment. Assessment is a big issue in both digital humanities and community-engaged classrooms, and ours was both. While I provided consistent feedback to students in the form of individual responses to blog posts and tweets, project management e-mails and meetings in and out of class with regard to tasks for the TAVP and the APWA, an in-class digital project proposal workshop, one-on-one consultations on final digital projects, and in-depth written responses to final projects, I did not assign grades until the end of the class. For the most part, students responded well to this format. Our class had great momentum. Every student completed all requirements for the class, quite a number of them going well above and beyond. But some student evaluations indicated that the gradelessness of the class was a challenge. I take seriously issues of assessment in a course where the work does not neatly correspond to a system of letter grades. The question of how to assess digital scholarship and community-engaged learning looms large at this juncture in higher ed. Is it a matter of channeling student work into grade categories no matter what and however uneasily? Is it a matter of front-loading the class with extensive discussion about how their work will be valued and evaluated outside of the traditional grading system? What are the best strategies for providing students with the feedback they need to learn and succeed in the digital humanities/community-engaged classroom? This semester was undoubtedly a valuable experiment for me as an educator when it comes to assessment. The students’ feedback has provided me with a lot of important food for thought, and I look forward to implementing their suggestions in future teaching. More immediately, I look forward to connecting with other educators and taking on questions of assessment in my upcoming presentation centered on my spring class at the HASTAC (Humanities, Arts, Science, and Technology Alliance and Collaboratory) 2015 Conference taking place at Michigan State University May 27-30. My panel, titled “Thinking Outside the Archive: Engaging Students and Community in Special Collections Digital Projects,” will be a great opportunity to talk through issues of assessment with educators and archivists facing similar challenges. Recently in “English 10-714: Freedom and Imprisonment in the American Literary Tradition: A Multidisciplinary Approach,” we’ve been exploring the rich audiovisual oral history collection at Columbia University’s Rule of Law Oral History Project, which features perspectives from various stakeholders around the Guantánamo Bay detention facility. Of course, first people have to watch these oral history videos! But I love the idea that AV oral histories might play a central role in efforts to raise awareness about the historic relationships in the U.S. between structural injustice and incarceration, both domestically and in terms of our foreign policy. As part of our ongoing partnership with the Texas After Violence Project in “English 10-714: Freedom and Imprisonment in the American Literary Tradition: A Multidisciplinary Approach,” students in the class recently completed an orientation session on GLIFOS Social Media, the digital archiving software used by the Human Rights Documentation Initiative (HRDI) in order to host digital primary source collections. Kathryn Darnall, Digital Asset Management Intern at the HRDI, provided us with a comprehensive yet highly accessible overview of GLIFOS, including many opportunities for students to interact with the technology and experiment with its functions. Screenshot from the GLIFOS page for a TAVP interview with Ireland Beazley. Students will input metadata on editing pages like this one in order to make interviews available on the public page of the HRDI. In addition to completing the GLIFOS orientation, students also engaged with the TAVP this past week by contributing to a class HistoryPin gallery featuring selected clips from TAVP oral history interviews. You can explore our gallery here. 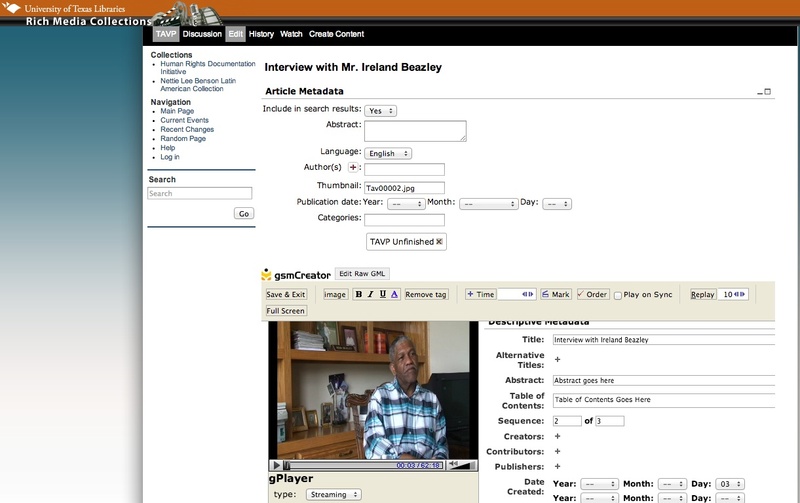 Screenshot from class HistoryPin gallery of TAVP oral history interview clips. This week in “English 10-714: Freedom and Imprisonment in the American Literary Tradition: A Multidisciplinary Approach,” several students posted on our class blog about the experience of listening to a Texas After Violence Project (TAVP) oral history interview. The TAVP collects oral history interviews from people across Texas who have been affected by the death penalty in our state. 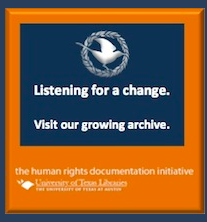 The audiovisual interviews are archived at the Human Rights Documentation Initiative. The motto of the TAVP–“Listening For A Change”–indicates the TAVP’s goal of influencing public discourse about capital punishment in Texas by providing a forum for individuals to share their stories. Another student, who listened to an interview with Iliana López (see screenshot above), noted that this interview reinforces the importance of oral history at large. This is a significant point to which I would like to return over the course of our class discussions this semester. Why is it important that we bear witness to injustice by engaging with oral histories? What do we do with our emotions when listening to troubling narratives? What are some productive ways in which we can process and respond to the stories of injustice we’re encountering?